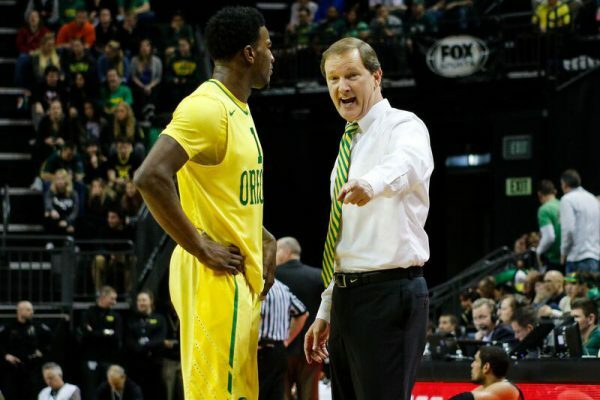 Is Dana Altman the Greatest Coach Nobody Talks About? As the Ducks embark on one of their most exciting seasons ever, let’s pause to remember how lucky we are to have Dana Altman running the show. After Ernie Kent’s firing, rumors were rampant that Oregon was chasing Michigan State’s Tom Izzo, Baylor’s Scott Drew, Kansas’ Bill Self, Steve Alford of New Mexico State, or Mark Turgeon of Texas A&M. Just as it is today, most didn’t see how good Altman was at the time. Altman was named the top NCAA Division I men’s basketball coach in 2013. A few years ago I created the phrase, All In With Altman. I’m still all in. Over 30 years he’s compiled a tremendous 622 wins and a .656 winning percentage. Even more impressive is that he’s done it at non-traditional basketball schools: Marshall, Kansas State, Creighton and Oregon — and without a bevy of future NBA stars on his rosters. Assuming he coaches for another six years and just wins 25-26 a year, as he has averaged so far at Oregon, he’ll be in the Top 5… all-time. Barring the unforeseen, in five to six years he’ll pass coaching greats Denny Crum, John Wooden, Phog Allen and Ralph Miller and be one of the 15 winningest coaches in college basketball history. What Makes Altman So Special? Altman can take his guys and beat your guys, then take your guys and beat his guys. He’s prepared for everything, and over-prepared for everything else. His teams set real screens, they can shoot the mid-range jumper, and they play team defense. Specifically, they play both a man-to-man and a matchup zone, and the way they play them confuses college guards and creates mayhem for offenses. After an Oregon made basket you’ll see Oregon in its zone press. The press is designed to take a team out of its offense maybe even more than steal the ball. A quick, long, wing player is put at the top. Dwayne Benjamin was terrific in that role a couple years ago and this year look for Will Richardson, Louis King and VJ Bailey up there. The Ducks let teams pass it side to side and prevent vertical passes. Soft pressure is applied to get the offense to pass the ball to the sideline, preferably near half court where you’ll see an immediate trap. Richardson has the speed, length and tenacity to thrive in Altman’s defenses. The goal is to bleed 12-14 seconds off the clock before teams get into their offense. Oregon can play the matchup zone and waits for the offense to show what it wants to do. They play hard and then with about 10 seconds to go, Oregon mysteriously slides into a man-to-man and extends the defense. By the time the offense figures out what’s happened the shot clock is winding down. Most college players have never seen defenses that can switch in mid-possession. It’s confusing, chaotic for an offense, and its magic if all five defenders play well together. It’s also great if you have a shot blocker back there so you can extend the D as Oregon’s had for a few years now. Set plays are about coaches with imagination and players buying into what they dream up. All five guys have to buy in, or they don’t work. Here’s an example. A few years ago Oregon got a turnover in their back court just before the half with 3 seconds to go on the clock. Sideline inbounds. Oregon quickly substitutes in the speedy Kendall Small who hadn’t played in a week. What? Why? With 3 seconds to go they’re not going to dribble it up are they? The Ducks set a screen, Small rubbed off it and raced straight up the sideline. The ball was passed 10 ft. in front of him into the front court. (Remember the clock doesn’t start until it’s touched.) Small grabbed it in one motion, shot it toward the rim. Turns out it was a lob to a flying Benjamin. Dunk, two points. Defenders standing around in awe. You can only run that if your team knows the play cold. They’ve never run it since (that I’ve seen). I’ve never seen anyone else run it, either. But in that situation, for that moment, they were prepared. Over-prepared. That only happens if everyone buys into the team. As they say themselves, “Sometimes you, sometimes me, always we.” A perfect statement for why Altman’s team win so much every year. Dwayne Benjamin drops it down hard on the Cougars. 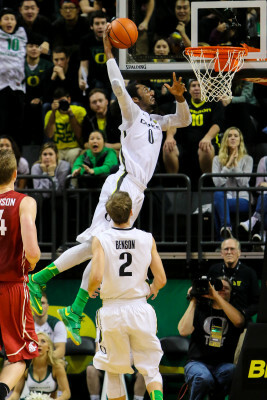 • The Ducks won 46 straight at home under Altman until Boise State threw up a half-court buzzer-beater last year. 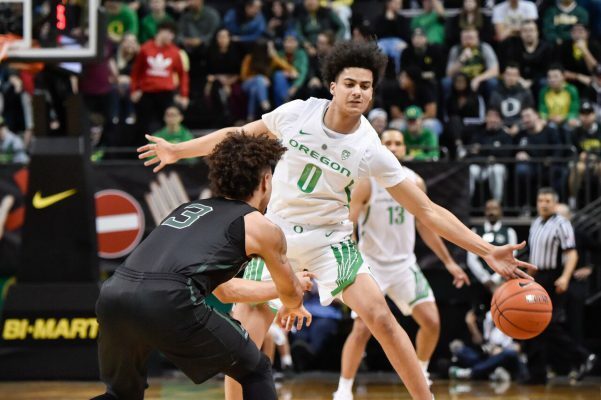 • Altman has only had seven or so players drafted (Mitch Richmond, Kyle Korver, Rodney Buford, Tyler Dorsey, Jordan Bell, Dillon Brooks and Troy Brown). He might have three drafted just this year off his current roster (Bol Bol, Louis King, and Kenny Wooten). 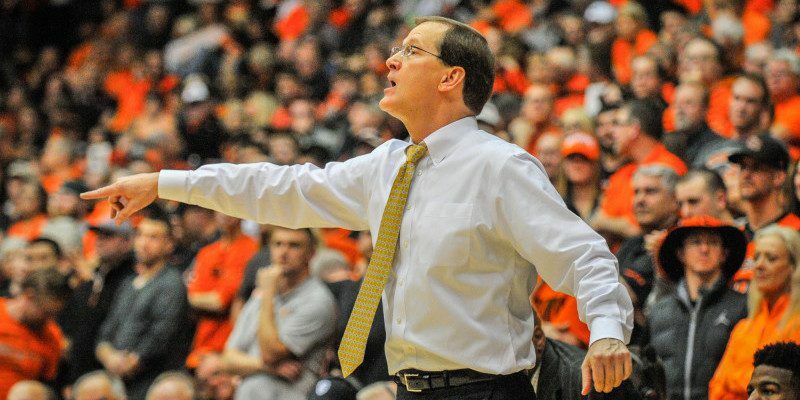 • Altman: Conference Coach of The Year awards at every school he’s coached, Pac-12 Coach-of-the-Year three times, and 2013 National Coach of the Year. • Oregon has averaged 26 wins a year with Altman as head coach. Chandler Lawson, a 4-star forward from Oak Hill Academy and the 87th-rated player nationally in 2019 has committed to Oregon. That makes three in Altman’s Class of 2019 (Lawson, Chris Duarte, and Isaac Johnson). More on Johnson in a moment. Lawson chose Oregon over Kansas, Memphis, and Ole Miss. His high school coach for the first few years was former NBA great and Memphis State Tiger Penny Hardaway. The Duck staff put some work in on this one to get him away from the Jayhawks and the hometown team. He’ll take Paul White’s spot on the roster. 6′ 11″ center Isaac Johnson committed to Oregon last week. The 4-star out of Utah is ranked anywhere from the nation’s 70th to 88th-best player, depending on which scouting service you look at. He reportedly narrowed his final choices down to Oregon and Gonzaga. He won’t make an impact next year or in 2020, though, as he’ll be going on a two-year mission and join the team in 2021. Clearly, he and his family trust Altman isn’t going anywhere for awhile.